When I talk to clients with children looking for a place to take them for a summer vacation and when I talk to young clients looking for a challenging way to spend a few days, I know there are a lot of options for travel this summer. Wisconsin may not stand out as a big destination, especially for those born or raised in the West Coast. But fear not, the Midwest is not all flat and boring. Aside from Starved Rock and Devil’s Lake, Northern Wisconsin has a lot to offer the outdoor enthusiast. This past Spring when I attended the Adventure Travel Expo, I stopped by the booth of Wildman Ranch. The representatives there were super friendly and a little…wild. 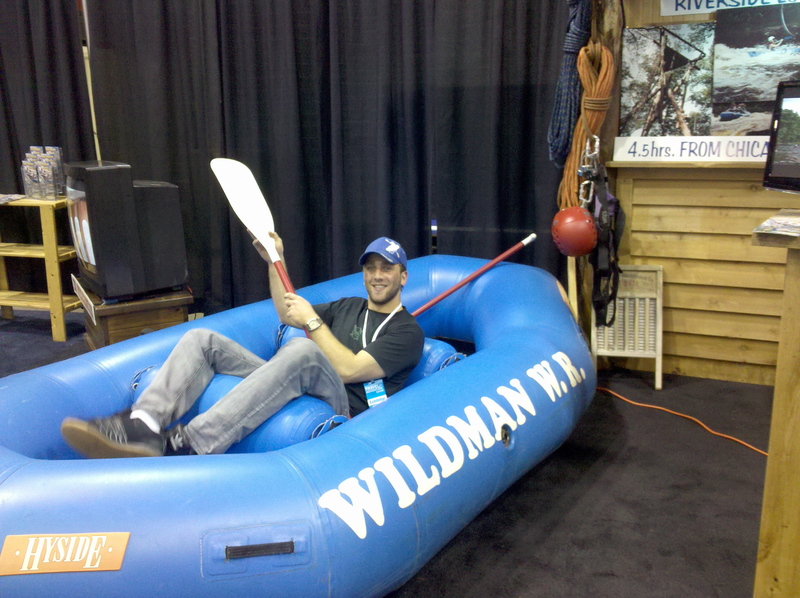 They had a white water raft in their booth and one of the gentleman agreed to pose in their raft! What can you do at Wilman Ranch? Be a wild man or wild woman. Or even a wild family! • Wildman Whitewater Ranch is an outdoor adventure resort and whitewater rafting center in the Midwest. • The ranch offers whitewater rafting trips down the scenic Peshtigo and Menominee Rivers in Wisconsin near the Michigan border. • Challenge yourself on their 60-ft tall High Ropes Course and adrenalin-pumping Giant Swing. • Explore the Northwoods wilderness on an ATV Trail Tours and, in the winter, on a Snowmobile Tours. • Scale the terrain of the Rock Dam Gorge with a supervised Rock Climbing and Rappelling adventures. • Team up with your friends or family in an exciting afternoon of Wildman Paintball Pursuit. If you are feeling mellow, try out the “Lazy River” Tubing, Lake Touring in a Sea Kayak, or a round of golf on the Wildman USGA Golf Course. Wildman ranch also provides campsites and cabins nestled among towering hemlock trees along the river’s edge just beneath the famous Horse Race Rapid of the Peshtigo River, the longest stretch of whitewater on the entire river. Rates for rafting run from $32 for an adult up to $54 depending on the rafting course you select. Children rates run less. Click here for rates on all Wildman activities. 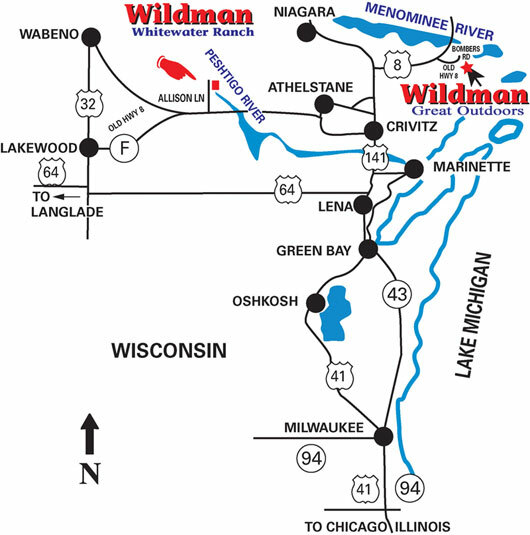 Wild Man Ranch is located just north of Door County, 4.5 hours from Chicago.